Easily grown in moist, well-drained soils in full sun to part shade. Invasive plant that is difficult to eradicate from the landscape once established. Inula britannica, commonly called British elecampane, British yellowhead or meadow fleabane, is an erect, rhizomatous, sunflower-like, herbaceous biennial or perennial in the composite family. Once established in the landscape, this plant will spread aggressively and rapidly by seeds, rhizomes or root fragments. Although this plant has been, albeit unintentionally, introduced into North America in the past, it is only known to have escaped cultivation and naturalized in a very limited number of areas in Ontario, Quebec, New York State and Washington D.C. Notwithstanding its very limited physical presence in the U.S., its aggressive and invasive tendencies are well-known. Some U.S. nurseries have encountered situations where rhizomes of this plant have been intertwined and well hidden within the root systems of hostas imported from a few European nurseries, thus suggesting a possible unintentional release and subsequent naturalization of plants via transactions taking place in the normal course of commerce. 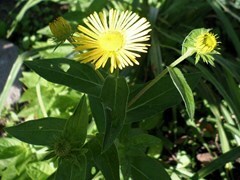 In 2010, Inula britannica was added to the Federal Noxious Weed List which prohibits the importation or movement of any listed noxious weed into or through the United States. This plant is native to Europe and Asia where it typically thrives in a variety of moist habitats including marshes, meadows, ditches, stream banks, wet grassland, wet woods, roadsides and wastelands. Bright yellow sunflowers (to 1” across) subtended by linear floral bracts bloom alone or in clusters of 2 or 3 from June to September on stems rising to 15-30” tall. Each flower features yellow rays surrounding a center disk of darker yellow tubular flowers. Leaves are sparsely hairy above but densely hairy beneath. Short-stalked basal leaves (to 6” long) are elliptical to ovate-elliptical. Stalkless shorter cauline leaves are lanceolate-elliptic to lanceolate-linear. Leaf margins are smooth to finely-toothed. Stems range from almost hairless to being densely covered with appressed hairs. Seeds are light brown with feather-like hairs which facilitate easy dispersal by wind. Specific epithet is in reference to the presence of this plant in Great Britain. No serious insect or disease problems. Invasive spreader. None. Federal Noxious Weed since 2010.